The Old Thatch is centrally located on the beautiful Isle of Tiree in the Inner Hebrides. It nestles in a small cluster of houses, known as ‘Macleans row’, in Tiree’s main township, Scarinish. The cottage looks out on to open grazing and has views of the sea from the front. It has easy access to the shore at Scarinsh harbour and adjoining beaches, and is just a short walk to shops and local facilities. 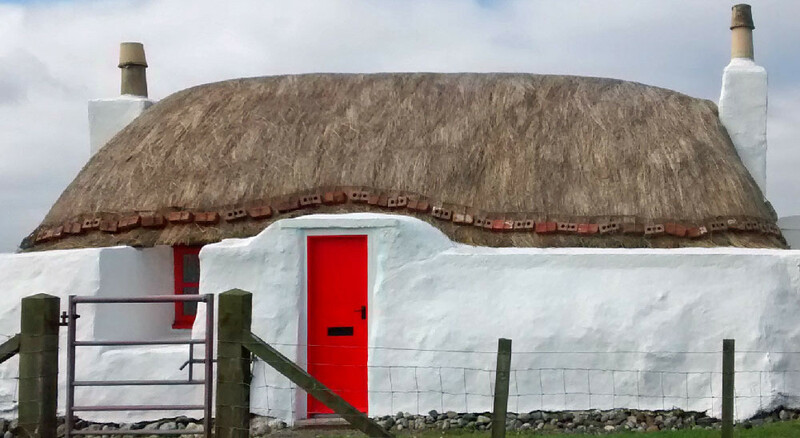 The Old Thatch is one of the few remaining traditional Tiree thatched houses. It has thick stone walls and is thatched with marram grass from the local shore. The cottage is small but perfectly formed, providing comfortable accommodation for 2 people. It has been sympathetically restored to a high standard providing modern comforts, whilst maintaining it traditional features and charm. to enquire about booking the Old Thatch. We currently have some availability in Spring 2019.
or telephone (01879) 220570 to enquire about booking the Old Thatch.